A little Christmas message from me to you. First of all I want to thank all my readers out there who have taken a chance with a new author. I very much appreciate the support. I wanted to take this opportunity to speak to you in a different way this time. At this time of year, most of us are worn to a frazzle by now. 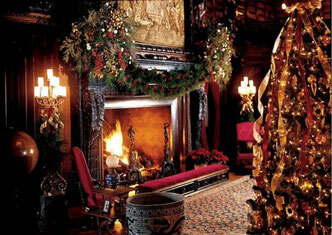 Your home is decorated nicely, the shopping is finally completed, it is isn't it? You might now have some time off work for a hard earned few days rest to enjoy all the work you have done since Black Friday. What I'd like you to do now is give a little gift to yourself. No, not to buy one of my books. Here's what I mean. One evening during the holidays, do yourself a favor by turning off the idiot box, extinguishing the not-so-smart phone & hide it in the bottom of your sock drawer. Don't worry, you won't ever miss the stupid tweet from some fool celebrity, and the world won't come to an end if you aren't among the first to know that some "entertainer" & I use that term loosely, did yet another stupid thing. Dim the lights, sit on the floor or your favorite easy chair by the tree & grab yourself a glass of something good. If you have a fireplace, all the better. Sit there either alone or with someone special in your life and just quietly look at the lighted Christmas tree. Take a deep breath and a good long sip. Feel the tension ebb away. Start thinking about what Christmas and this time of year is really all about. Think about what's important to you. If you are young, think about what you life is like right now. What would you like for your life to be like. How did your parents live? Were they happy? Was it fun growing up? What was Christmas like back then? Are you married? Do you have small children? What is their Christmas like for them? What do you want for them? What kind of country do you want them to grow up in? If, like me you're a little older, not old mind you, it's just that you have a little mileage on you. Maybe you're in your forties or fifties or sixties. Your kids are grown and maybe even have their own lives now. Remember way back when. Remember how Christmas was when they were small. Remember how you tried to make it just like it was when you were little, but never could get it just right somehow. Remember what it was like when you were growing up back in the fifties and sixties like me. It sure was different then, wasn't it? We were all the same. White, black, red, yellow, didn't matter. Same values, same wants, needs, likes, worries. Same culture. People sure were different back then weren't they? What happened? It's all gone. Why are things the way they are now? Better refill your glass. So what's different? Do you even know who your neighbors are? Do you know the folks up the street or around the corner? Should you be retired but are still working because your retirement savings melted away a few years ago? Or is it, retirement, what's that? Do you find yourself watching what you say in public because you might offend one of the perpetually offended? Does it seem that we are all afraid of each other? That we are all divided into groups with different interests and priorities, yes even different cultures now. Isn't it time for this PC insanity to just go away? Are we all pitted against each other, or is it that we have been pushed and herded into these groups? By whom, and for what purpose? Does it seem like we are living in someone else's world and we are merely players being manipulated? By whom and for what reason? Don't you think it's more than a little strange that our government openly spies on our every waking moment? All for our own good of course. It's always for our safety, or for the children. "They" are keeping us safe. From whom? And just who is "They?" Is this the America that you grew up in? Is this the America that you want to hand down to your children someday? Is this the way it ought to be? An America where our traditions are ridiculed and scorned, and sometimes even criminalized. Back in the day, did you ever envision this America? And what about what I call "those men." Those men, those farmers and shopkeepers who stood their ground on the green at Lexington so long ago. Those men who took a stand and told King George not just no, but Hell No! at Concord bridge. How was it possible that all those brilliant men were living at the same place on this earth at the same time, with the same ideas and ideals. Did that just happen? A twist of fate? An accident of time? Pure dumb luck? Or was there a greater hand involved? Isn't there something bigger than kings or presidents or governments? Have you ever even thought about it? Those men. Do we not owe them a debt of honor? To hold on to our freedoms bought with their blood for dear life, and pass on down what they risked it all for. They thought it was worth it. Do we? Take a look at the star or angel or whatever you have as your tree topper. What is the meaning there? If you have small children, are they nestled all snug in their beds, dreaming of... what? Sugarplums? iPads, iPhones? or whatever the next computerized crap to come out is. Have they ever been taught the Christmas story? No, not the one about the Red Ryder BB gun. Heavens, now in this strange and upside down "new" America even thinking about a BB gun is reason for the SWAT team to show up, and whisk your children away to some re-education camp. I mean the real Christmas story. And what about Santa Claus? What does he really look like? 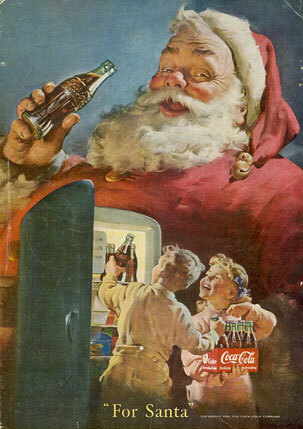 I think it's the Coca Cola Santa, always a twinkle in his eye, but that's just me. Is there any Santa in you? I certainly have asked a lot of questions. I have of course after much consideration come up with the answers, but it's not my place to tell you folks what your answers will be. That is for you alone to decide. For tonight though, fill your glass once again, and gaze up at that beautiful Christmas tree or Menorah, or pyramid of empty beer cans, whatever. Make believe that for this night, America is right side up and once again that "shining city on the hill." Maybe give a little thanks to whoever you feel put you here in this place, this wonderful country, this America, on this night.